I feel like there are some necessary startup processes to get you up and running quickly with a glimpse or vision of the product/end goal. And then some set of similar, or refined, or slightly modified practices that carry on during the life of the main product development period. I liken it to getting the skeleton up and running, or the “tree trunk and main branches” upon which we can rapidly build out the app. PDF: Iterative Development Path Agenda. 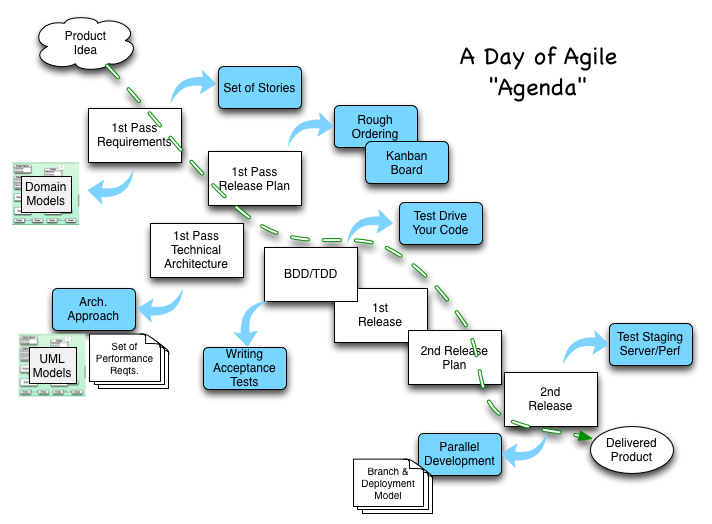 This entry was posted in agile techniques, process on January 17, 2019 by jon. And I go to the user field management list for "acme"
Then I should see "Test Field"
And I should see "test_field"
And I should see "Yes"
Note: for now I am not going to discuss the other improvements that could be done with this feature (e.g., to remove the “click” steps). Sure enough, the text “Yes” was indeed on the page, given the step was defined simply as shown below. However, the intent of the test was actually not correctly followed in the code. So one way to ensure the proper data appears in the proper place on the page, especially when it is in a table, is to do the following. And I follow "New Field"
By adding a “findable” id to the output, you can more exclusively assert some text is on the page in the correct location! This entry was posted in cucumber, testing on March 1, 2016 by jon. I bet you never heard of Feature-Driven Development, eh? Having worked with Peter Coad since the early 90s, and Jeff De Luca in the late 90s, I’ve been a fan of FDD and naturally turn to that style when “user stories” are not so user-centric. And yes, those are typically the minority items on our backlogs. Software development is working through a prioritized to-do list. Most of the to-dos should be about addressing user needs. Call them user stories, call them features, maybe even call them requirements. Whatever works best to help you organize and communicate what needs to be built. Features (create a quote, edit a quote, archive a quote). One of the keys to successful software development, is to combine the list of features with a domain model (and some UI mockups don’t hurt). The domain model need not be to the nth degree of UML detail. But one that clearly describes — in just enough detail — what your problem domain is all about. This eliminates the need to write all sorts of detail in the development issues, leaving that to the model. Then the feature list become more about the order in which we are building up various aspects of the product feature sets. Thanks for paying a bit of homage to FDD. A blast from the past! This entry was posted in agile, agile techniques on August 3, 2015 by jon. The disjointed and terse example on the Magellan docs page does leave one asking for more details. I had a great deal of trouble to get the nesting correct on my page that also included the topbar element. There seemed to be conflicts with having the topbar being contain-to-grid and fixed. This entry was posted in foundation on April 27, 2014 by jon. When Should You Think Doing Software? This entry was posted in agile, Philosophy on March 11, 2014 by jon. And then it just worked! This entry was posted in rails on February 15, 2014 by jon. I’ve been saying for seemingly decades, this is (one of?) our nascent software industry’s biggest conundrums (maybe even an enigma?). But seriously, wouldn’t it be awesome if we could measure something? Anything? Delivering useful features on top of a reasonably quality architecture, with good acceptance and unit test coverage, for a good price, is success. Every real engineering discipline has metrics (I think, anyway, it sounds good — my kids would say I am “Insta-facting™”). If we were painting office building interiors, or paving a highway, we could certainly develop a new process or a new tool and quantitatively estimate the expected ROI, and then prove the actual ROI after the fact. All day long. In engineering a new piece of hardware, we could use costing analysis, and MTBF to get an idea on the relative merits of one design over another. We would even get a weird side benefit — being relatively capable at providing estimates. Will experience exponential (or maybe not quite that dramatic) production drop off in ensuing years, requiring greater effort to keep the production going. Predictability will wane. I could make some assertions that $Y is a bit more costly than $X… Or not. Let’s assume more costly is the case for now. If we look at $X and $Y in years 1 through 10, we might see some numbers that would make us choose B over A. But most of the people asking these questions are at year 5-10 of Garden A, looking over at their neighbor’s Garden B and wanting a magic wand. The developers are in the same boat… Wishing they could be working on the cooler, younger, plot of Garden B.
What’s a business person/gold owner to do? After all, they can’t really even see the quality of the garden, they just see output. And cost. Over time. Unless they get their bonus and move on to the next project before anyone finds out the mess in Garden A. Of course, the new person coming into Garden A knows no different (unless they were fools and used to work in Garden B, and got snookered into changing jobs). Maybe we abandon Garden A, and start anew in a different plot of land every few years? Then it is cheaper over the long haul. I think the reason it is so challenging to get all scientific about TQM, is that what we do is more along the lines of knowledge work and craftwork, compared to assembly line. The missing piece is to quantify what we produce in software. Just how many features are in a bushel? I submit: ask the customer what to measure. And maybe the best you can do is periodic surveys that measure satisfaction (sometimes known as revenue). This entry was posted in agile, Philosophy, process, quality on October 30, 2013 by jon.